Wreath Storage Bag Just $10.99! Down From $19.99! You are here: Home / Great Deals / Amazon Deals / Wreath Storage Bag Just $10.99! Down From $19.99! You can get this Wreath Storage Bag for just $10.99 right now – down from $19.99! TOP QUALITY PROTECTION – Keep your precious wreaths in tip top shape and shield them from damages and debris just in time for the holidays with this Premium Quality Christmas Wreath Storage Bag by Zober for wreaths up to 30” in diameter. TEAR RESISTANT MATERIAL – Protect your delicate wreaths by keeping them in our tear-resistant plastic storage bags. This incredibly convenient wreath bag keeps your decorations dust and critter-free so that they’re ready to show off! CLEAR CARD SLOT – Know which wreath is inside the Christmas bag without even having to unzip it! Each plastic wreath storage bag comes with a transparent card slot for easy labeling and at a glance identification! HOLIDAY THEMED DESIGN – No more scouring your attic through all of your large storage bags to find your wreaths! You’ll spot this festive wreath storage container right away! 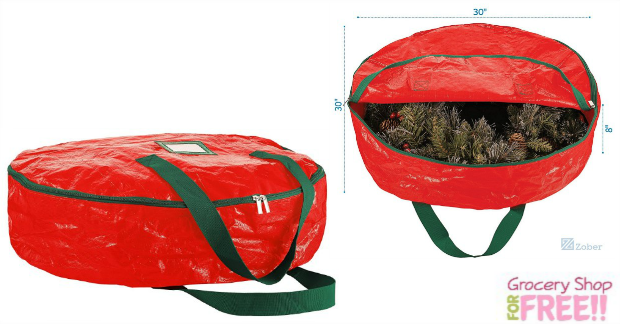 STURDY HANDLES – Tote, hoist, and move the wreath carry bag with ease as it features sturdy handles that are stitch-reinforced to the bag; making Christmas Storage a breeze!